I often see patients who complain about looking older than they feel, or of being told they “look tired all the time.” Eyelid (or blepharoplasty) surgery can make a tremendous improvement to a person’s appearance, giving them a younger, fresher look. When would someone consider having a blepharoplasty (eyelid surgery)? A Blepharoplasty is usually used to treat excessive eyelid skin, bags around the eyes, or to reduce the effects of aging. This procedure typically involves removal of sagging skin of the upper or lower, or both eyelids. Oftentimes, the fat around the eye bulges with age. If this is the case, the excess fat is either removed or repositioned. A droopy brow is generally part of, if not the entire problem, creating the illusion of excessive eyelid skin. For best results, the eyelids and brow must really be considered together. It is important to mention that a Blepharoplasty will not remove dark pigmentation under the eyes, nor will it completely eliminate lines such as ‘crow’s feet’. Adjunctive treatments can be helpful for those problems. In your consultation, I will discuss your desired outcome, as well as evaluate the shape of your eyes, symmetry, and the proportion of the tear troughs in relation to the cheeks. A surgical plan will be carefully developed, while your pre and post operative expectations are discussed. It is very important to assess the position of the eyebrow. 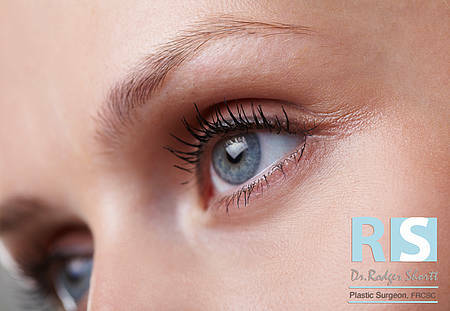 What is the typical recovery time with eyelid surgery? Blepharoplasty is typically a day surgery and is performed either under general anaesthetic, or heavy sedation and local anaesthesia. The operation takes between one and two hours. The recovery is generally straightforward. Bruising and swelling improves significantly over the first seven to ten days, resolving entirely by up to three months. I recommend taking two weeks off work, and if you have an important event coming up, try to allow six weeks recovery. Incisions are placed in skin creases and are barely perceptible after they have healed. Walking is encouraged, but no heavy exercise should be performed for one month. The results of this procedure are fairly immediate, however, as the face ages revisions may be necessary. You should expect the benefits to last for 10 to 15 years, depending on what has been done. Eyelid surgery is very common and the results can be excellent. It is important to choose a surgeon that you are comfortable with, who has taken the time to assess your entire eye region, including your brow, lids, and cheek.